Usually I have some sort of an Appreciation of Stone, or this, or this . . . on the weekends, but today I am feeling appreciative of one of my favorite tools . . . My Fiskar’s ax. Over the years I have used several axes and different types of wood splitting tools and the ax has done the job better than any of my previous tools. To be a great ax there needs to be two important attributes for that to happen. One; can the ax hold an edge? Over a lot of use, splitting several different types of wood will the edge hold? Two; what is the weight of the ax? The lighter the ax, the faster the handler will be able to swing the ax. The faster the swing means more momentum, force, and power . . . for me, that’s splitting power with ease of use. Which is exactly what this ax gives me. 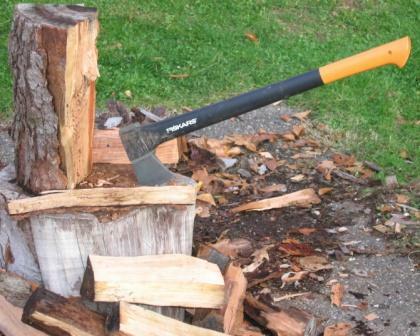 Other factors include balance of the ax, and the strength of the handle. The woods behind our house are full of dead, damaged, diseased, and weakened trees, which is our main source of firewood. The area is not in very good shape, and I’m guessing it was logged out about 25-30 years ago when they really cleared it out. This amount of material gives me a lot to work with and I am grateful I have this ax to work with. Light, strong, good steel, and a strong handle. I’d say if you’re looking for a good splitting ax, that holds a great edge then you need to go with a Fiskar’s. I understand it is readily available at either a big box store, or one of your better hardware suppliers. By the way, I was not paid by Fiskars or a representative of someone who supplies Fiskars tools to endorse this ax, honest. No one, not a soul. Not doing field work like I used to I am constantly trying to find other ways to stay active that do not impact my knees. 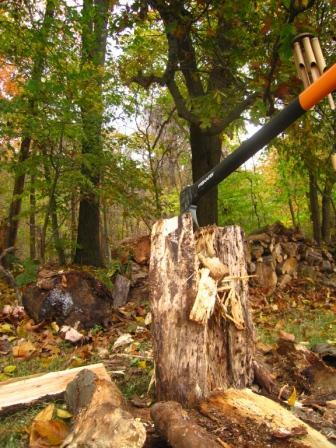 Splitting wood is one of them; from swinging the sledge for halving down to the final pieces for the fireplace. Something satisfying about walking into the barn and seeing the cords of wood piled along the South wall, or feeling the warmth of a fire on a cold winters day. The size of the winter heating bills is satisfying to look at also. I have one of those also(fiberglass handle-welded wedges) that I like to use on medium size stuff to halve that, or to quarter really large pieces-especially maple, beech and oak. 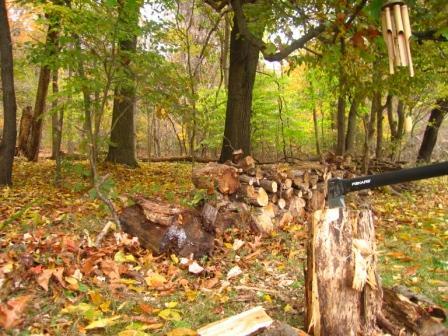 But I sure like the control I get with this ax to get a certain size, and to split down other pieces to make kindling. An aside, I’m actually thinking about buying a ‘fro’ to make kindling with. . . . any experience with one of those? With firewood one is twice warmed.